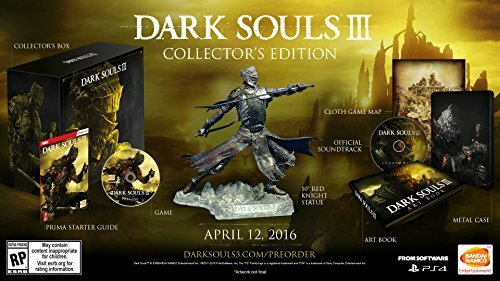 Dark Souls 3 Collector's Edition Preorder — GamingWithSwag.com - Dads By Day, Gamers By Night. Red Knight also featured as the Mouth of Sauron in Return of the King. Dark Souls has been growing in popularity and for the third release we get a Statuette Collector's Edition in April for $129.99. While this game is gaining fans, I would imagine they don't have a ton of these available and so this may sell out before release. The statue is 10 inches and features the Red Knight, you also get a cloth map which I would like to see become a more regular item in these editions as they hold up better than the paper ones. The other items are pretty traditional - Steel Case, Soundtrack, Art Book, and a Prima Starter Guide. Available on Xbox One and PS4.